The activation by abscisic acid (ABA) of current through outward-rectifying K+ channels and its dependence on cytoplasmic pH (pHi) was examined in stomatal guard cells of Vicia faba L. Intact guard cells were impaled with multibarrelled and H+-selective microelectrodes to record membrane potentials and pHi during exposures to ABA and the weak acid butyrate. Potassium channel currents were monitored under voltage clamp and, in some experiments, guard cells were loaded with pH buffers by iontophoresis to suppress changes in pHi. Following impalements, stable pHi values ranged between 7.53 and 7.81 (7.67±0.04, n = 17). On adding 20 μM ABA, pHi rose over periods of 5–8 min to values 0.27±0.03 pH units above the pHi before ABA addition, and declined slowly thereafter. Concurrent voltage-clamp measurements showed a parallel rise in the outward-rectifying K+ channel current (IK, out) and, once evoked, both pHi and IK, out responses were unaffected by ABA washout. Acid loads, imposed with external butyrate, abolished the ABA-evoked rise in IK, out. Butyrate concentrations of 10 and 30 mM (pH0 6.1) caused pHi to fall to values near 7.0 and below, both before and after adding ABA, consistent with a cytoplasmic buffer capacity of 128±12 mM per pH unit (n = 10) near neutrality. Butyrate washout was characterised by an appreciable alkaline overshoot in pHi and concomitant swell in the steady-state conductance of IK, out. The rise in pHi and iK, out in ABA were also virtually eliminated when guard cells were first loaded with pH buffers to raise the cytoplasmic buffer capacity four- to sixfold; however, buffer loading was without appreciable effect on the ABA-evoked inactivation of a second, inward-rectifying class of K+ channels (IK, in). The pHi dependence of IK, out was consistent with a cooperative binding of at least 2H+ (apparent pKa = 8.3) to achieve a voltage-independent block of the channel. 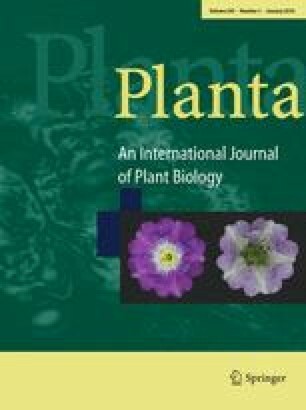 These results establish a causal link previously implicated between cytoplasmic alkalinisation and the activation of IK, out in ABA and, thus, affirm a role for H+ in signalling and transport control in plants distinct from its function as a substrate in H+-coupled transport. Additional evidence implicates a coordinate control of IK, in by cytoplasmic-free [Ca2+] and pHi. We are grateful to G. Thiel (Pflanzenphysiologisches Institut, Universität Göttingen, Germany) for helpful discussions. This work was possible with equipment grants-in-aid from the Gatsby Charitable Foundation, the Royal Society and the University of London Central Research Fund. F.A. holds a Sainsbury Studentship.